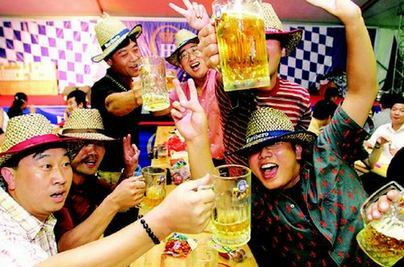 It's the 18th annual Qingdao Beer Festival and everyone's on an Olympic high. The Fuwas will be there to let off a bit of pent up tension and discuss career moves with their weird cousin Haha Beer. Who knows what other mascots you might bump in to. Officially ranked as one of the top 10 festivals in China, the drinking got underway last Friday and will extend to the end of the National Day Holidays. Last weekend was the biggest opening weekend the festival has ever seen with 180,000 people knocking back 66 tons of beer on opening night alone. Festivities are taking place at the International Beer City and the very keen can enter from 9am. Keep reading below for more details of how to get there. How to get there: By plane: 1 hour from Beijing around 700RMB – take a look at tickets here. By train: 4 hours from Beijing. Pay RMB184 for a hard seat on the D51, D55 and 59 services. See this site for full train schedule. Once you’re in Qingdao: From Airport to the International Beer City Take the airport shuttle to Haier Industrial Park for RMB 15. From there you can take a cab to the festival for about RMB 20. From Train Station to the International Beer City Then take bus number 104, 301, 304, 313, 321 or 362 bus to Jinjialing stop which is on the corner of Xianggang and Haier Lu. A cab from the train station should set you back about RMB 30.
International Beer City Daily 9am-10pm. 195 Xianggang Zhonglu (corner of Xianggang and Haier Lu), Qingdao, Shandong. RMB 10, 20.